Sg Truth: PAP Ministers - Stunned and Shocked? Singaporeans go to polls today after a period of campaigning quite unlike any other the island republic has seen in the past. TODAY, Singaporeans go to the polls. Nothing strange about that, they do this every fifth year or so. And given the dominance of the ruling People's Action Party (PAP), its impressive track record of building the island state into a powerful economy, its control over the apparatus of state, its pre-emptive nature especially where elections are concerned, polling in Singapore tends to be rather boring and deplete of surprises. At a superficial level, one could say that major campaigning issues included skyrocketing prices, the terrorist suspect Mas Selamat escaping, huge overspending on the Youth Olympic Games, and the flooding on Orchard Road. No doubt, the fact that the PAP government presupposes that its ministers and its way of doing things are close to perfect turns any mismanagement, no matter how minor, into a lightning pole for criticisms of the system. To be sure, election campaigns held once every four or five years, is the only time when critical voices can be publicly raised in Singapore. But this does not explain why in the middle of the campaign period, Prime Minister Lee Hsien Loong felt compelled to make a public apology, not only for his father Minister Mentor Lee Kuan Yew's warning to voters in Aljuneid constituency that they would have five years to “repent” if they kicked out the PAP, but for the government's mistakes in general. Given the remarkable rebound growth rate of 14.8% for 2010, one would have thought PAP parliamentarians would get a smooth ride back into power. But that has not turned out to be the case. The opposition challenged the PAP for all seats except for Kuan Yew's Group Representation Constituency (GRC), and has embarrassed PAP leaders more effectively than any Singaporean had thought possible throughout the week. What is causing the change, and why now? The underlying sociological changes can be seen in the fact that as many as 46% of voters and voting is compulsory in Singapore where there is no walkover were born after 1965, when the country became independent of Malaysia. Indeed, every fourth voter is younger than 36 years old. This means, half of those casting their votes today came of age in a Singapore constructed meticulously by the PAP. But unlike their parents, they do not seem easily susceptible to intimidation and threats about the impending doom of the country. Informed through new information technologies, and thus not reliant on the PAP-controlled mainstream media such as The Straits Times, their perspectives are not only framed differently and not influenced by repeated arguments from the PAP ad nauseam, they are developed in retaliation to those arguments. This breaking out is what is new, and it caught the overconfident PAP unawares. 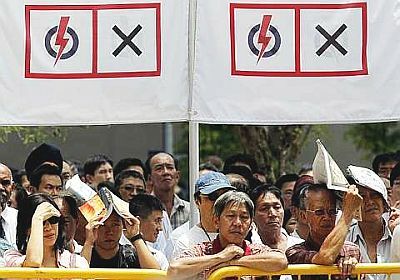 Now, while the PAP has always prided itself as an adaptable and pragmatic party, the disconnect between its style of handling the public and the bold and new ways, through which the opposition managed to articulate public concerns, was painfully obvious in the beginning of the campaign period . In calling PAP ministers arrogant, the opposition managed to act as a conduit for broad public unhappiness over being excluded from policy making, and over the widening income gap made more obvious by the huge jump in GDP last year. The growing influx of foreigners has also become a big worry for the working class. The final day of the campaign was fascinating for what PAP leaders declared in closing, and for what, this perhaps to their credit, says about their ability to grasp the problem at hand when forced to do so. “They want to be engaged and involved. They want to be talked to, not talked down to. By making a public apology mid-week, Lee tried to show a willingness for the PAP to change, which did help control the damage the party had done to itself earlier in the week. Playing on the popularity of the Prime Minister, Deputy Prime Minister Teo Chee Hean, ended his campaign by pleading with voters not to burden Lee further by voting out any of his ministers. Paradoxically, the minister most in danger of losing his seat is the popular Foreign Affairs Minister George Yeo. His GRC of Aljunied is the one the WP had been doing everything it could to win. It is nevertheless a stunning surprise though, that Yeo chose to end his campaign by promising voters that he would in practice turn subversive, and if re-elected would work from within the PAP to transform it! The need for these PAP leaders to conclude in such a conciliatory fashion under pressure interestingly validates the opposition's position that the Singapore parliament needs a strong non-PAP faction in order for the government to stay grounded and accountable. The star of the election is undoubtedly Nicole Seah of the National Solidarity Party. Overnight, the eager 24-year-old became one of the most popular politicians in Singapore, and has in a flash become the face and the voice of her party. Her message happily received by the crowds was the need for Singapore to become a compassionate society. Another new star is Pritam Singh, a member of the WP's “Team A” challenging Yeo. This relatively newcomer proved to be so impressive a public speaker, that the party let him lead the crowd in reciting its “National Pledge” to end the campaigning. Today, a record 94.1% of Singapore's voters will make their choice. Most analysts are hesitant about predicting the outcome. In Singapore, enormous turnouts at opposition rallies are notoriously unreflective of what the final results will be. But what everyone is waiting to know is; will a GRC actually fall to the opposition? Just as importantly, will the popular vote for the PAP actually fall below 60%? Whatever the outcome, Singapore has changed. And Singapore politics will never be the same again.